First of all, please accept my apology for my English’s weak points, and request you to be patient in reading as I am not a professional writer, nor a politician. In Myanmar, whenever government face any political failure, she gear up pressure of persecution on Rohingya people or Islam. To do this systematically, the government gives training all of her servants including police, immigrations, officers, educators and religious monks against Islam and Muslims. Christians are also persecuted but not much like Muslims. There was an anti-Chinese riot in 1967, killed many Chinese and looted their properties, later, Burmese Buddhists look Chinese as pro-Buddhist partners, and they believe that they can make Chinese to be Theravada Buddhists easily. 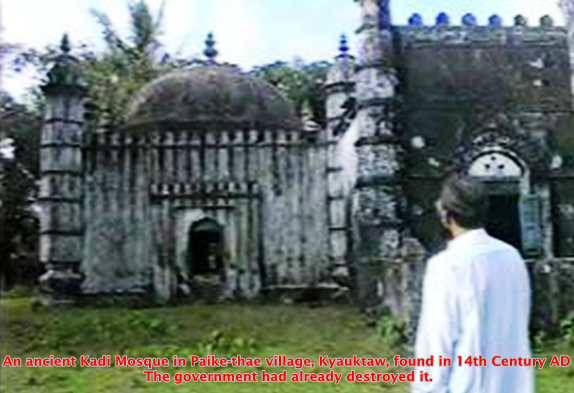 Muslims dedicatedly and sincerely worked for Myanmar during the Dynasties periods, colonial periods, and parliament democratic periods but in the Socialist government period, the government started to restrict Muslims rights, and cleared Muslim history especially primary sources such as ancient monuments, books, peoples who were educated. The government has been using “divide and rule policy” to make Muslims as dangerous threat for the country. Immigration’s slogan is “The earth cannot swallow population, people can swallow Myanmar population”, it applies for the Muslims only. In the government schools, Buddhist worship-rooms are installed and every morning before students start the lessons they should recite Buddhist religious saying including the Muslims students, whoever doesn’t like to recite got punishment. After 1988 demonstrations, the government has been encouraging to do Buddhist activities in every street, every quarter, and every office. As the same time, she has been warning the danger of Islam and Muslims. She uses Immigration law as the main persecution tool. It is very easy to clear all evidences of Muslims but in Arakan State, it is very difficult because there are a lot of historical monuments, records, and primary sources. So her main priority target became Arakanese Muslims called Rohingya. Firstly, she destroyed and cleared all historical monuments which proved that Rohingya are original inhabitants of Myanmar. There are still thousands of historical facts that affirmed Rohingya’s existence before British occupied Myanmar in 1826-1885. If you study Random House’s Compact Atlas of World History, page 60 and 61, you could find map of Islamic State in the Arakan. Thousands of historians wrote including Myanmar historian about Rohingya and Muslims but the government is still denying Rohingya’s existence. It is like a person who feels sun’s light and heat, then denies the existence of Sun. How did government clear the evidences of ancient monuments of Muslims? 1. Narameikhla (a) Sawmon Solaiman Shah 1430-1434 AD. These rohinjas want to go to the West or to Malaysia as refugees. Let them go. They will be good workforce for developed countries.